Pacific Gas and Electric Company requested a Certificate of Public Convenience and Necessity for the construction of a new 27-mile 230-kV transmission line from the Jefferson Substation in San Mateo County to the Martin Substation in the City of Brisbane. 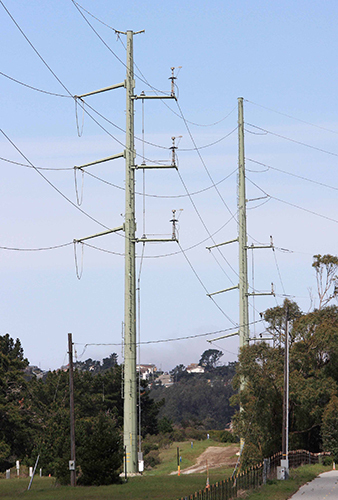 The project consists of two parts: (1) the southerly portion is an overhead transmission line that replaces an existing overhead 60-kV transmission line with an overhead double-circuit 230/60-kV transmission line from the Jefferson Substation to a transition station in the City of San Bruno; and (2) the northerly portion is a 12.4-mile underground line within existing streets and in a San Francisco Bay Area Rapid Transit right-of-way ending at the Martin Substation. The overhead portion of the transmission line follows the existing 60-kV transmission line alignment, replacing the existing 60-kV transmission line and existing towers with a new 230-kV transmission line and new towers in the same alignment and at approximately the same locations. These new towers support the new single‑circuit 230-kV line and a single‑circuit 60-kV line. In addition, the project included construction of a new transition station on San Bruno Avenue for the overhead to underground transition, as well as modifications to substations and equipment to accommodate the new 230-kV line. Electric and magnetic fields and visual impacts were major issues of concern for this controversial project, and a wide range of biological resources (e.g., serpentine grassland) could be affected in the overhead portion of the route. There was high public involvement, especially from residences along the southern segment of the route along the I-280 corridor. On behalf of the California Public Utilities Commission, Aspen prepared a comprehensive Environmental Impact Report (EIR) for the Jefferson-Martin Transmission project, which included an extensive public involvement program. In 2004, Aspen was presented with the award for Statewide 2003 Outstanding Environmental Analysis Document by the Association of Environmental Professionals for the Jefferson-Martin 230-kV Transmission Project EIR.